An international team of researchers from the French National Research Institute for Sustainable Development (IRD-France), Université Côte d"Azur, University of California Los Angeles and California Institute of Technology has determined the propagation speed of the 7.5 magnitude earthquake which occurred in Indonesia in September 2018: 4.1 km/s along 150 km. The results, which also shed light on the earthquake rupture path, are published on February 4th in Nature Geoscience. Earthquakes happen when rocks on either side of a tectonic fault shift suddenly in opposite directions. Two main seismic waves that carry out shaking of a breaking fault are S-waves, which shear rocks and propagate at about 3.5 km/s, and P-waves, which compress rocks and propagate faster, at about 5 km/s. Geophysical observations show that the speed at which an earthquake ruptures along the fault is either slower than S-waves or almost as fast as P-waves. The latter, so-called supershear earthquakes, occur very rarely and can produce very strong shaking. Only a few have been observed, and they happen on faults that are remarkably straight, geological "superhighways" that present little obstacle to speeding earthquakes. In this study, the international team coordinated by Jean-Paul Ampuero, seismologist at IRD and Université Côte d"Azur, analysed the 7.5 magnitude earthquake that rocked the Sulawesi island in Indonesia on September 28th, devastating Palu's region. The impact of the event—more than 2,000 deaths—was aggravated by a devastating sequence of secondary effects, involving soil liquefaction, landslides and a tsunami. 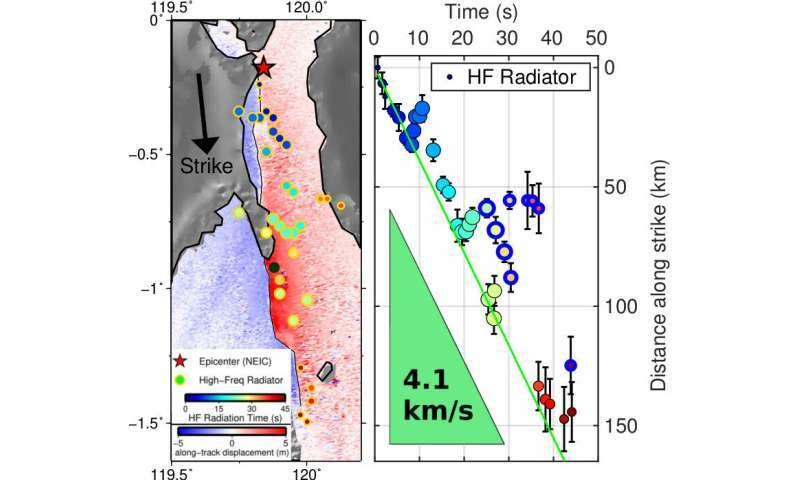 Thanks to a high-resolution analysis of seismological data, researchers identified the propagation speed of the earthquake: 4.1 km/s, an unusual speed, between the speed of S- and P-waves. "This is the first time we observed this speed so steadily," underlines Jean-Paul Ampuero. "This earthquake ran in the 'forbidden' speed range, and can be considered as a supershear event, even if it's not as fast as previous ones." By analyzing optical and radar images recorded by satellites especially re-tasked to observe the earthquake aftermath, the researchers determined the path of the fault rupture. They found that the fault was not straight, but had at least two major bends, and left more than five meters of ground offset across the city of Palu. " This path has major obstacles, which should have reduced the earthquake's speed, but it stayed at 4.1 km/s along 150 km," says Jean-Paul Ampuero. The findings challenge current views of earthquakes in ways that could help researchers and public authorities prepare better for future events. "In classical earthquake models, faults live in idealized intact rocks ", says Ampuero, " but real faults are wrapped in a layer of rocks that have been fractured and softened by previous earthquakes. Steady rupture at speeds that are unexpected on intact rocks can actually happen on damaged rocks, simply because they have slower seismic wave speeds." The Palu earthquake may offer the first clear test of such recent models if followed up by studies of the structure of the fault and its zone of damaged rocks. Because the impact of an earthquake depends strongly on its speed, such studies on other faults around the world could anticipate earthquake effects better. Future work may also determine if the speed of the Palu earthquake enhanced its cascading effects, by promoting coastal and submarine landslides that in turn contributed to the tsunami.